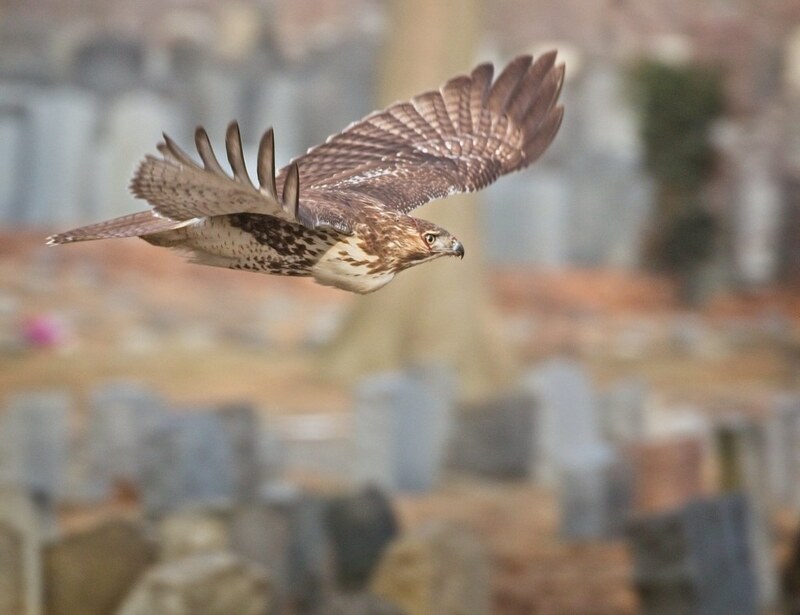 East Village red-tailed hawks, Christo and Amelia, have been busy working on their nest in Tompkins Square Park. Each day, they spend a few hours on nestorations, and I've been seeing them off to roost at sunset. For the last few days, Christo has been spending his nights inside the park within sight of the nest. While our local pair have been carrying out domestic duties, I recently visited a few other hawks who have been wintering in the area. 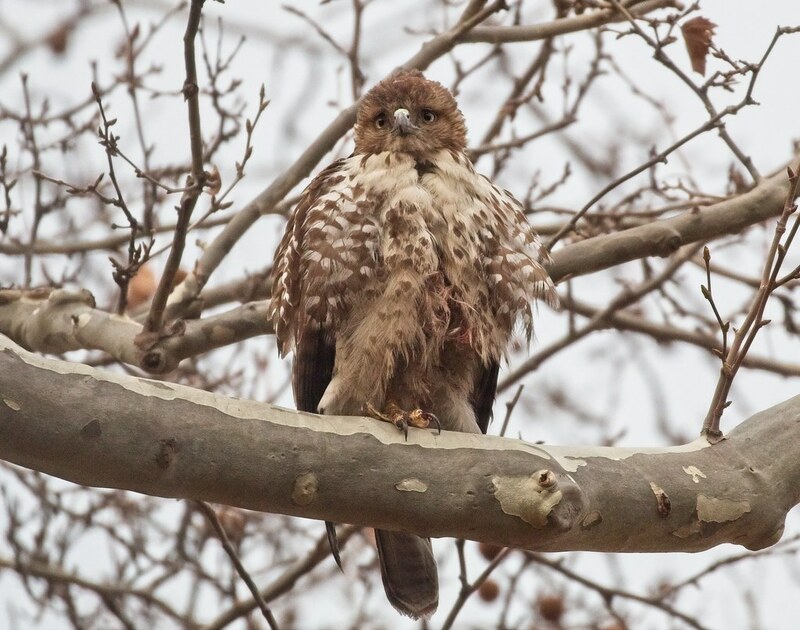 This young red-tail has been hanging around the Lower East Side for the last several weeks and has a distinctive face, making it fairly easy to identify. 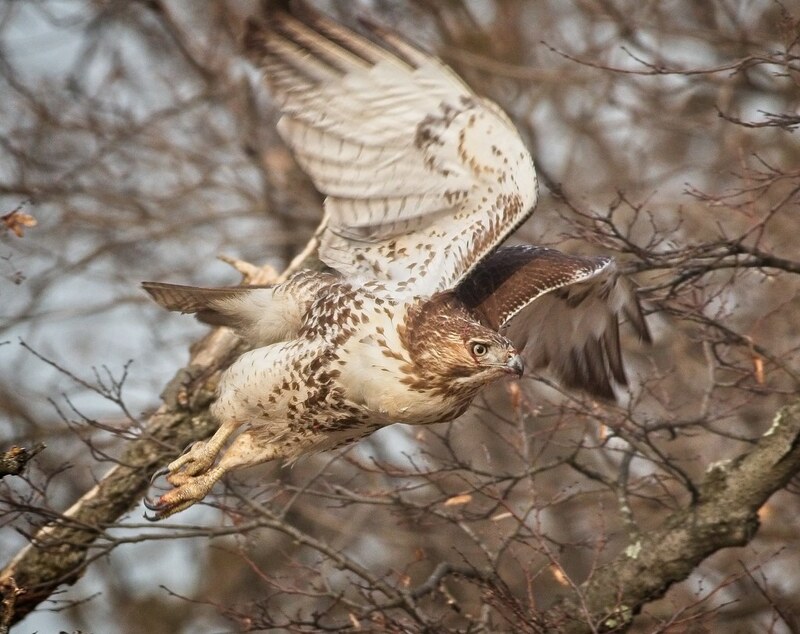 In the photo below, there is blood on the hawk's belly feathers, likely from tucking its talon up against its body after handling prey. 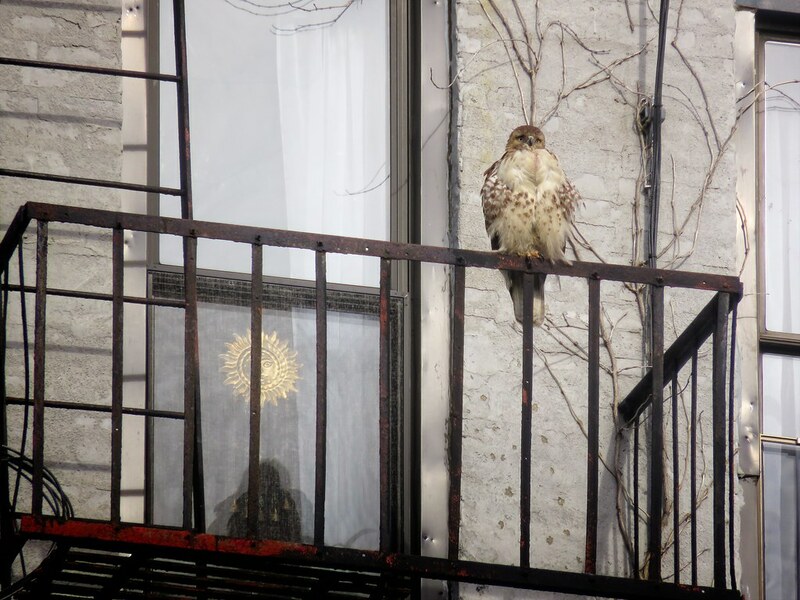 On St Mark's Place, I found another young red-tail trying to grab birds that were hiding in the cornices of buildings. 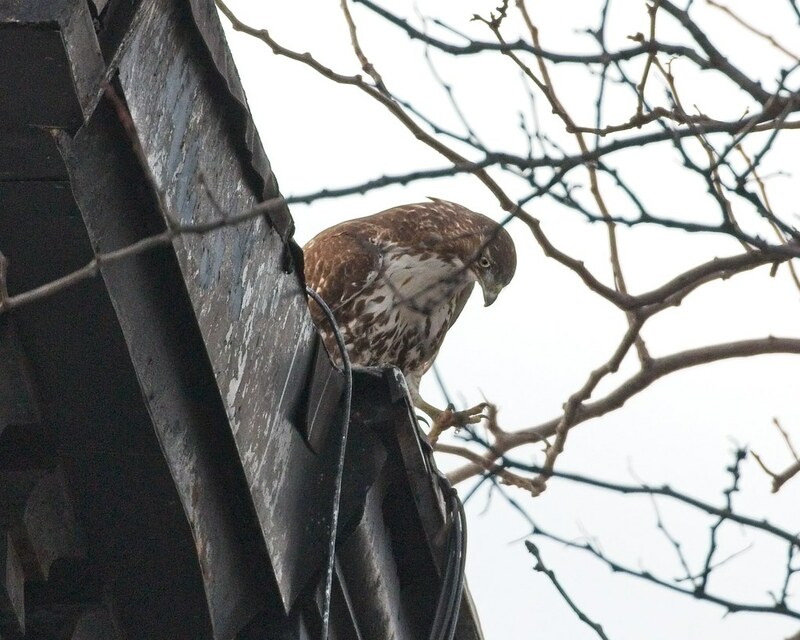 The hawk would perch on one side of the street, watching the birds go into cavities, then fly over to the cornice to reach over and try and pull them out with its talon. Although an interesting hunting technique, this hawk didn't have any success while I watched, and Christo eventually ruined the fun by chasing the young hawk away. 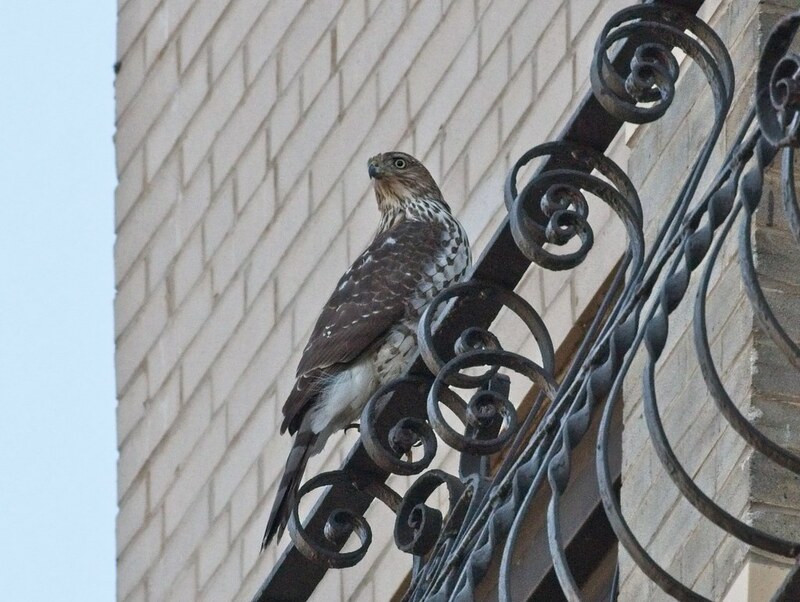 I've had several sightings of a young Cooper's hawk around the 9th Precinct on 5th Street. I can't be sure it's the same hawk each time, but the resident flock of pigeons on that block has been attracting a lot of raptor attention. 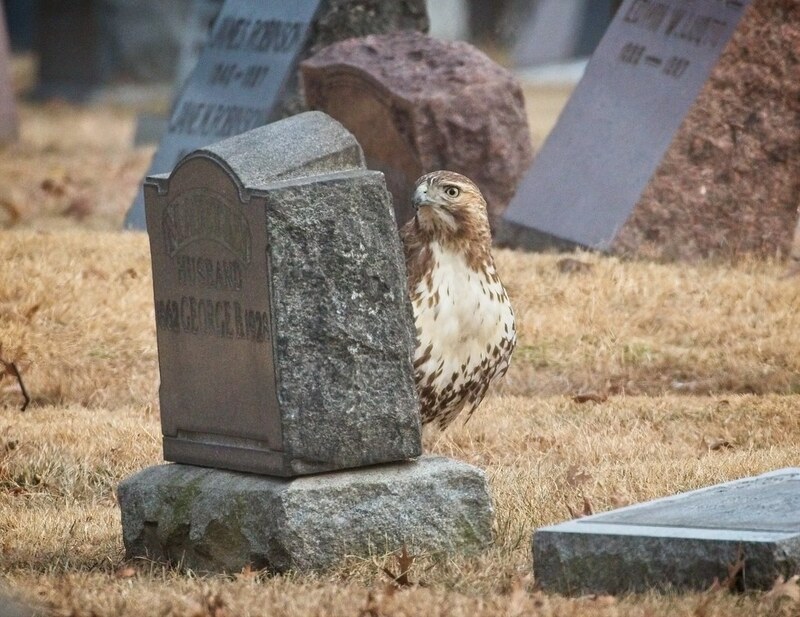 On a visit to Brooklyn the other day, I spotted a young red-tail lurking in a cemetery. 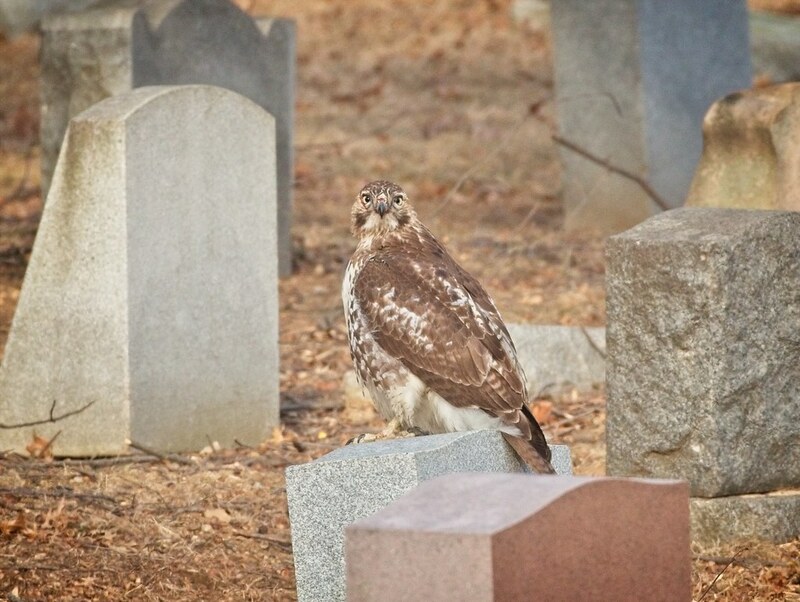 The large trees in the cemetery house a lot of squirrels, and the hawk just happened to nab one right in front of me. 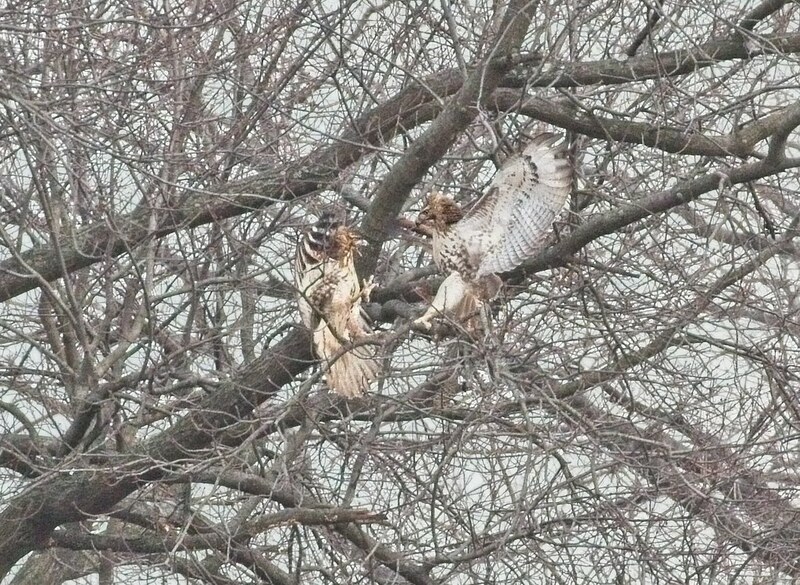 The hawk's lunch was soon interrupted by a second red-tail, and the two young hawks fought talon-to-talon high in a tree. I'm not really sure who is who, but I think the hawk on the left is the one who caught the squirrel. 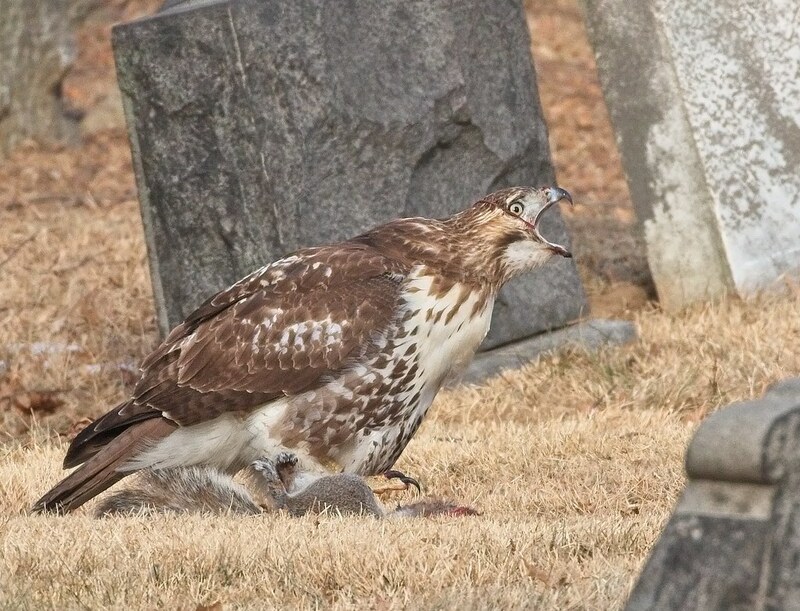 After driving the intruder out of the area, the first red-tail returned to its squirrel and seemed to gulp it down so quickly, entrails got wrapped around the hawk's head. 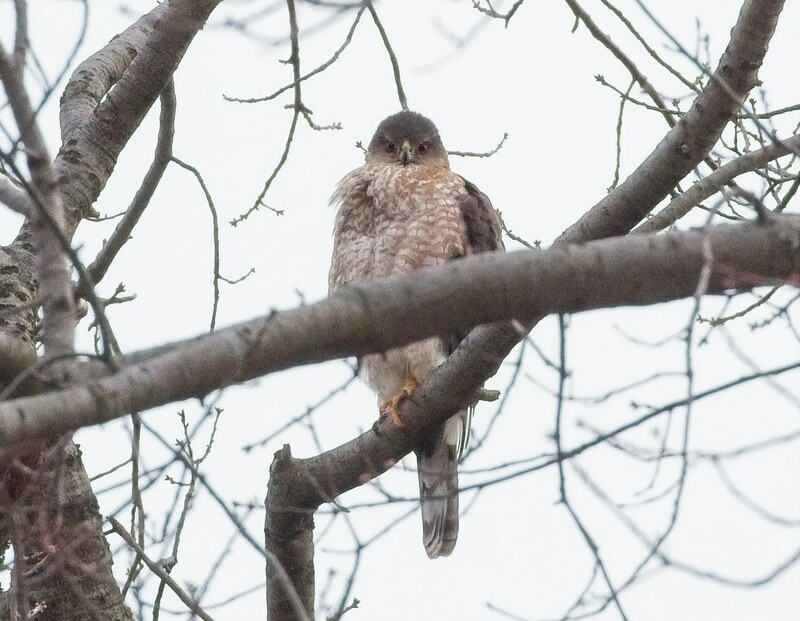 In the photo below, you can see the red squirrelgetti stretching from the hawk's throat up the right side of its face and over the top of its head. 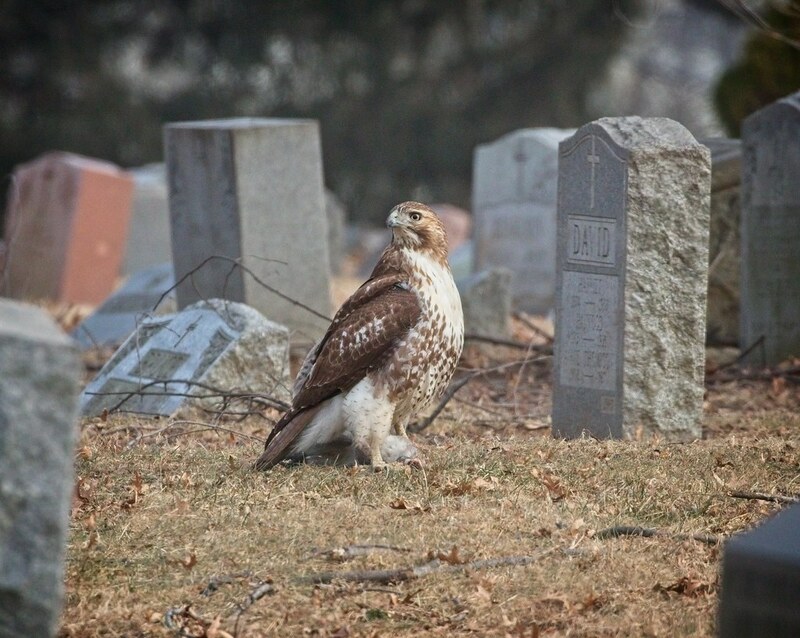 The hawk continued eating, but was unable to dislodge the entrails from its face. Below, you can just barely see the red string under the hawk's right eye and over its cere. In flight, the red thread is clearly visible on the right side of the face, along the edge of the eye. 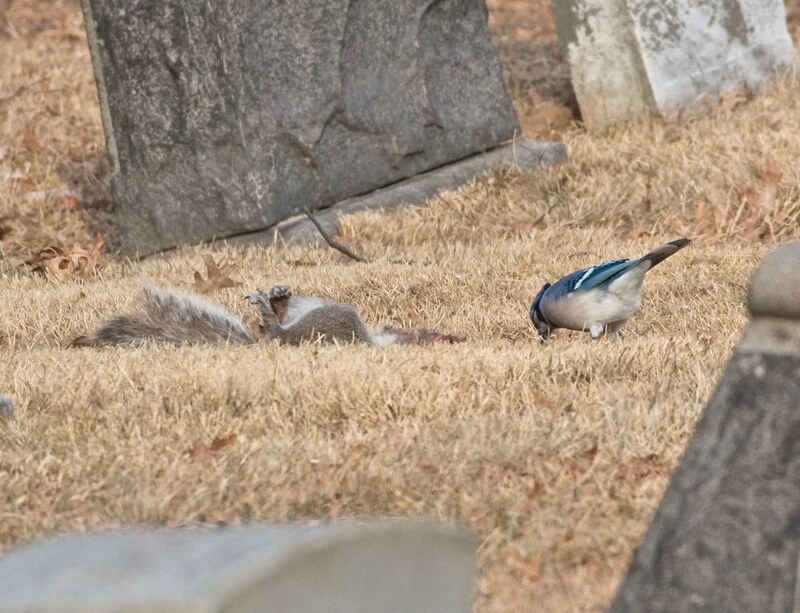 After the hawk took off and left its half-eaten squirrel behind, a blue jay flew down and nibbled at the remains. 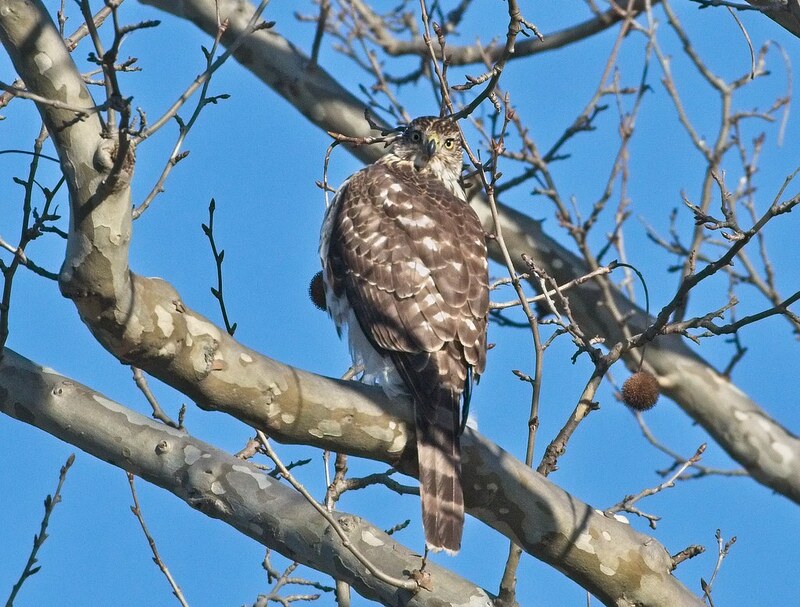 Meanwhile, an adult Cooper's hawk perched nearby. 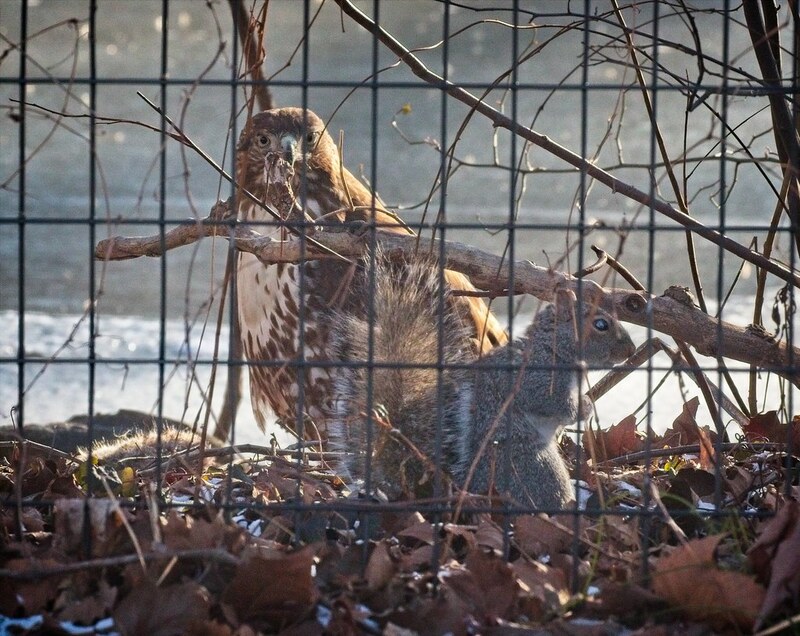 On the coldest day of the winter so far, I visited Queens and came upon what looked like a young red-tail and squirrel just hanging out together under some bushes. What?!? A closer look reveals the remains of another squirrel on the ground in front of the hawk. 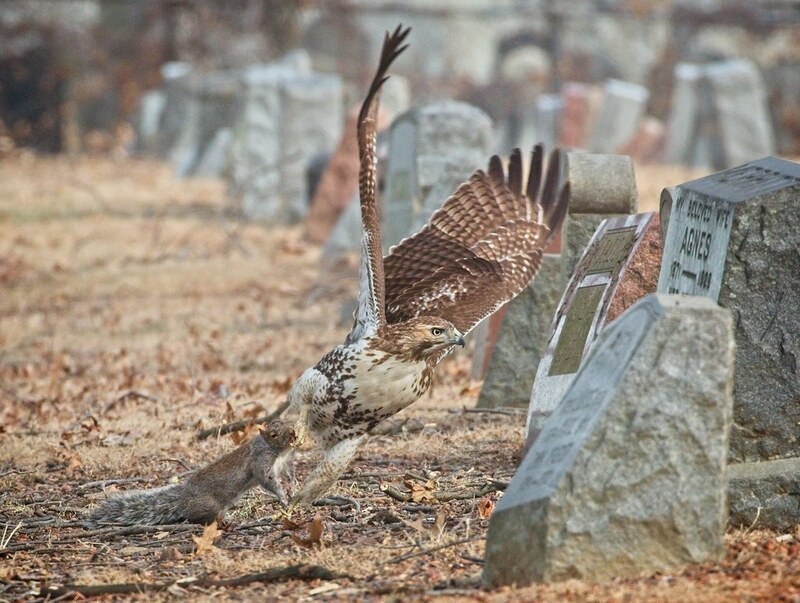 The bold squirrel was harassing the hawk as it tried to eat its frozen prey. 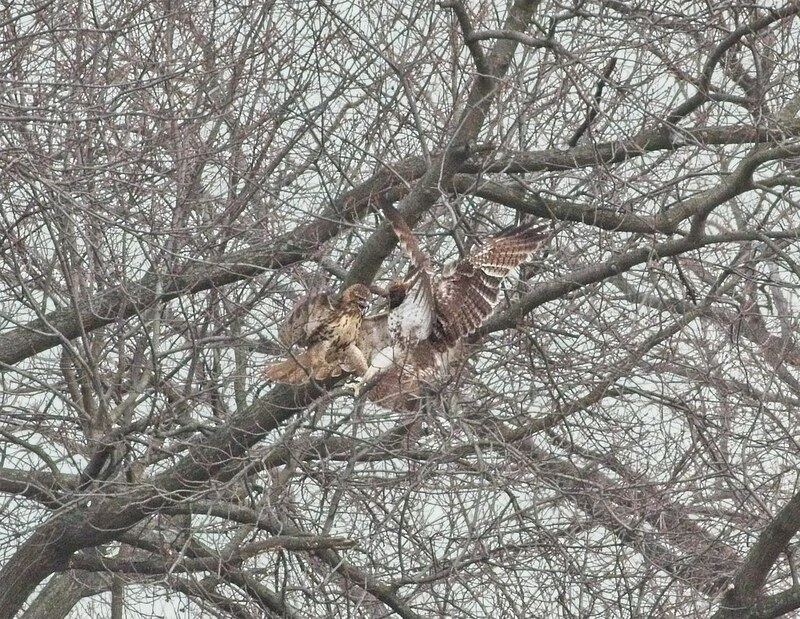 As if that wasn't annoying enough, this young Cooper's hawk took a dive at the red-tail before perching in a nearby tree and watching the red-tail struggle with the rest of its meal. The temperature at the time was 13°F with a frigid wind.